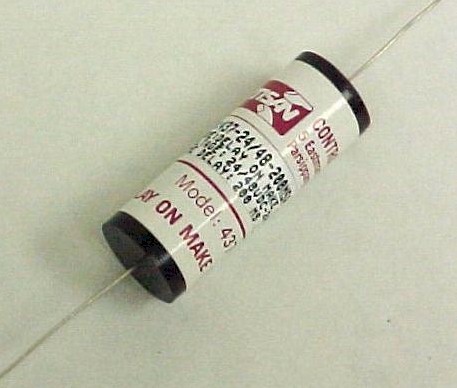 The model 437 is a Delay-on-Make timer which operates any DC device such as a relay, solenoid or lamp. When the DC voltage is applied, the 437 remains in the off state permitting less than 3 milliamperes to flow through the load. When the delay period has elapsed, the timer switches on permitting full current to flow through the energized load. The load remains energized as long as the DC power is applied. Voltage must be removed for at least 50 milliseconds in order for the 437 to reset. Polarity must be observed during wiring. Operating Voltage Any voltage from 5-200V DC. Output 20 milliamperes to 2 Amperes inductive. Inductive loads must have protective snubber diode. Timing Ranges Factory fixed from 50 milliseconds to 600 seconds. Timing Repeatability +/- 5% at stabilized operating voltage and temperature.